"Charles Petzold's new book -- this one for nonprogrammers -- is a remarkable accomplishment. Code is a very technical book about computers and software intended for a nontechnical audience. Charles Petzold is surely among the world's half-dozen most qualified authors to write such a book. Charles has an undisputed gift for understanding and explaining complex topics. It is not too much to hope, then, that Charles Petzold might one day write a companion volume that picks up where Code leaves off. That would be a book well worth reading!" Back in the day, during the Bad Times™, I came across a wonderful book: Charles Petzold's Code. His love for technology really came shining through in each chapter. While much of the content was not new to me, his approach and enthusiasm really stuck with me. It was instrumental in my returning to school for my CS degree and it's the first book I recommend to anyone seriously interested in programming - if coding is to by your passion you should fly through the book and then go back through it again, slowly, absorbing each nugget. Yes, it's that good. 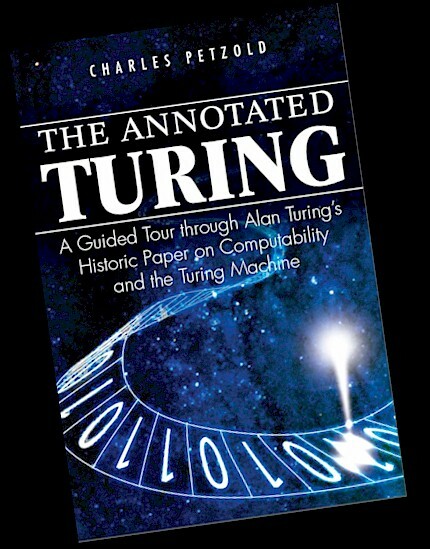 And now comes news of the spiritual successor to Code: The Annotated Turing. Here Petzold will work his way through Alan Turing's paper on computability that launched modern computer science. Turing lived a short, fascinating, tragic life and Amazon's summary says the book will also explore this background. While understanding Turing's work isn't necessary for modern software developers that churn out production code, it is for anyone who wants a full classical education in computers and technology. Based on Code, I'm really looking forward to what Petzold can do with this." "I also own Charles Petzold's book, Code. It's another love letter to the computer. Instead of a long, rambling love letter, Code is a collection of elegantly written sonnets. It has an austere layout, filled with beautiful diagrams. It gently guides you through the history of the computer, at the lowest and most fundamental levels, from Babbage to modern times. But it's no less urgent in its affections. I'm with Petzold and Walter. If loving computers is wrong, I don't want to be right." "How Do Computers Do What They Do? The Twelve-Year-Old wants to learn more about computers. Is there anything better to read than Charles Petzold (1999), Code: The Hidden Language of Computer Hardware and Software. In some sense, this is the book that I have been looking for for twenty-five years--the book that will enable me to understand how a computer does what it does. And--given the centrality of computers in our age--it has been a long wait. But now it is over. Charles does a much better job than anything else I have ever seen in explaining computers--what they really are, and how they really work. He has hit the sweet spot exactly. Enough detail to satisfy anyone. Yet the detail is quickly built up as he ascends to higher and higher levels of explanation. It remains satisfying, but it also hangs together in a big picture. In fact, my only complaint is that the book isn't long enough." "Charles Petzold is a very cool guy. Of course we've all read his 1998 Programming Windows, the bible of Win32... I've just finished another offering from Charles. It's called Code. It's absolutely worth it if you can find a copy. If you want to explain to your spouse what you do for a living, get it. This book should really be required reading in any CS101 class. Hell, I'd make it required reading for High School Seniors. It can "fill in the gap" for some many technology questions. So many people take technology for granted...it just works. I'm surprised at how few people ask "Why." My kids will read this book...I have no kids, so as soon as they are born...and learn to read." "...made me wish I this book was given to me at my orientation before my first year of college. I would have aced half of my classes! All in all, I learned quite a bit from this book...let's hope someone recommends this book to young CS majors at every university." "This book was written just for me. OK, maybe that's not entirely true... But somehow, it feels as though Code was written just for me. ...he leads you along a clean path that teaches you just about everything most computer science students struggle through for their first couple of years but with a minimum of pain. Petzold's engaging prose will make you feel smart just for reading it." "What I absolutely *LOVE* about this title (beyond the fact that it's written by Charles Petzold) is the ease and elegance in which Mr. Petzold teaches us about something very near and dear to his heart: The connection between what we as humans can understand and use to describe what it is we would like for a computer to do, and what computers can understand to do what it is we humans are asking for it to do, otherwise referred to as "Code" and "Binary", respectively." I'd start them off with Charles Petzold's book CODE. This is an exquisite introduction to how information is stored in a computer, how transistors work, etc. Without this sort of book everything that Python does is "magic.' "
"With delightfully clear language Charles Petzold explains the nature of binary codes using blinking flashlights and Braille. I don't have a degree in computer science or electrical engineering, but this book very nicely filled in a lot of gaps in my knowledge about how computers actually work. The beauty of this book is Mr.Petzold has managed to create a book that not only educates, but is also a joy to read. Anyone who wants a book to expand their knowledge of computer science without a heavy dose of "geek" talk will appreciate this book. A great book to share with friends who want to learn more about the way that computers work." "Quite simply, this is the best book I've read in years. You don't have to be an uber geek to get into this book. But, it does get fairly deep. For CS vets, this book may be one of the best reads you've had in a long time if you're a bit rusty on the logic fundamentals, and a must read if you don't know an AND gate from an OR gate." "Charles Petzold's Code: The Hidden Language of Computer Hardware and Software shows how modern computer programs are really not that different than the signal flags of long ago. This book will teach a new perspective to those that have always viewed computers through high-level languages. It is very entertaining and an easy read." "I have never read another author that can explain a concept better than Mr. Petzold. Mr. Petzold has a deep passion for understanding how things work. This is evident in Code - a book for everyone not just programmers. The explanation and history is presented in a way that anyone can understand and enjoy; told in the way only master storyteller can. Last month ago, Mr Petzold wrote in his blog he's been working on a sequel to Code. An explanation of Alan Turing's work on computability. I know this will be a great book, just like Code, but I'm afraid like Code it will sell far less copies than his programming books. This is a shame, because while the programming books go out of date with the next release of Windows, Code and it's sequel are timeless." "an excellent introductory book about computer hardware and software. "Code" starts from the very basics... This is not a "for dummies" book. The graphic design is skillful and clean, using graphics in a highly explanatory manner. This book will not hurt your eyes. This could be a great book for a first course on Computer Science; maybe not the main text, but it covers a lot of the core material that computer scientists just must know about." "I would absolutely recommend handing this book to a book-savvy pre-teen who is interested in computers. Had this book been available in 1990, I might be a programmer now instead of an aerospace engineer. [I think I prefer the aero bit. I like blowing stuff up.]" when I was learning about computing machines; the book would have made a lot of things clear right away. This book probably isn't for everyone, but anyone on the engineering side of the computer community should be familiar with the principles that Mr. Petzold explains so clearly." "If you'd like a good explanation at a relatively low but very approachable level of just how a computer works then I'd recommend Charles Petzold's book Code: The Hidden Language of Computer Hardware and Software. It's a very understandable book that starts from simple concepts and leads you through how to build a computer from relays. Not that you'd ever want to do such a thing. Even a barely functional computer with a tiny amount of memory (64kb) would cost several million dollars to build from relays and wires, and it would consume huge amounts of power and space. It would be made from several million relays and miles upon miles of wire."